What is often described as imperfection is in fact the true the beauty of the world. With that in mind, here is the eleventh installment of Notations, once again a day late! Inspired by Cage's 1969 book, Notations is a collection of graphic scores, hand drawn music calligraphy, computer code, compositional sketches, text scores, and other innovative forms of musical notation. 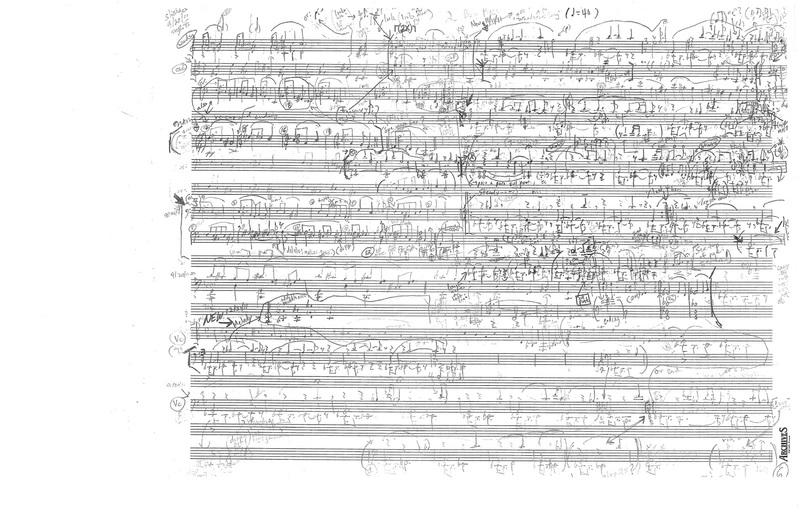 Every Monday (Tuesday this week...) we'll showcase notation by two different composers, primarily focusing on those local to Los Angeles. This week's composers are Michael Jon Fink and Douglas C Wadle. Michael Jon Fink is a composer/performer who resides in the San Fernando Valley just north of Los Angeles. For the last thirty years he has served on the faculty of the Herb Albert School of Music at the California Institute of the Arts where he teaches Composition, Orchestration and Analysis. He has composed concertos for soprano saxophone, bass clarinet, violin and cello as well as incidental music for two plays by W.B. Yeats and three by Wajdi Mouawad. 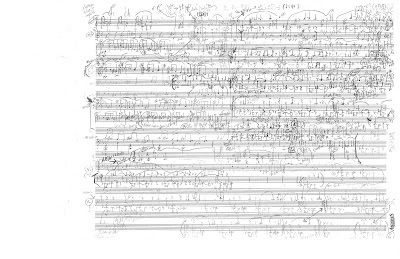 "A Folio of Large and Small Worlds Ending", a chamber concerto composed for world-renowned avant-garde cellist Frances Marie Uitti (who plays with two bows at the same time) was premiered at REDCAT in March 2012. He recently composed the score for Tareq Daoud’s short dramatic film La salle des maîtres, an Official Selection of the Film Festival Locarno. His “Prelude to Alone” for clarinets, trombones and electric guitar appears on the new “Cold Blue Two” CD Anthology (Cold Blue Music: CB0036 ). M.J.F. has been a composer/improviser with experimental and new music groups that have included the Negative Band, Musica Veneris Nocturnus, Stillife and Ghost Duo; and currently plays electric guitar with Pickaxe (Noise), Gods of Rain (Experimental Metal), the Feedback Wave Riders (Free Improv) and Trio Through the Looking-Glass (Jazz-inflected). His music appears on the Cold Blue, Contagion, C.R.I., Trance Port, Raptoria Caam and Wire Tapper labels. Douglas C. Wadle was born in 1977 in Hammond, Indiana and currently resides in Los Angeles. His work is rooted in the American Experimental tradition and frequently features extended just intonation and alternative notations. He also draws upon experimental literary and theatrical practices and his studies of auditory and visual perception, logic, and philosophy (of language and mind, primarily). Wadle has composed for various chamber ensembles and is an active performer in, primarily, interdisciplinary contexts, utilizing trombone, voice, text, visual arts and movement. He is a founding member of ,, duo and performs with The Unbuttoned Sleeves, a transdisciplinary improvisational quartet under the direction of dancer/poet Simone Forti. He studied Comparative Literature and Music at New York University (BA), Ethnomusicology at the University of California, Los Angeles (MA), and Music Composition, with James Tenney and Marc Sabat at the California Institute of the Arts (MFA). He previously taught at the California Institute of the Arts and is currently pursuing graduate studies in philosophy. Wadle's scores are published by Plainsound Music Edition. He co-authored the book Unbuttoned Sleeves (Beyond Baroque Books, 2006) with Simone Forti, Terrence Luke Johnson, and Sarah Swenson. His visual art scores, Amphibolyand Logos prior Logos, are included in the anthology, Notations21 (Mark Batty Publisher, 2009). He is a contributing editor for (The Open Space Magazine). His music has been recorded on Exit Records.